Glen Copus with a fleet of Elephants in Spokane. Photo by Ben Tobin via Elephant Bikes Facebook page. For a man whose career has woven in and out of many major eras of bike history, Glen Copus has managed to fly under the mainstream radar remarkably well. He raced cyclocross in Santa Cruz in the late 70s and early 80s with American cross pioneers Laurence Malone and Dan Nall. He learned how to build bike frames from Keith Bontrager, one of the godfathers of mountain biking. Copus worked as a race mechanic in Europe for the US women’s road team in the 80s. 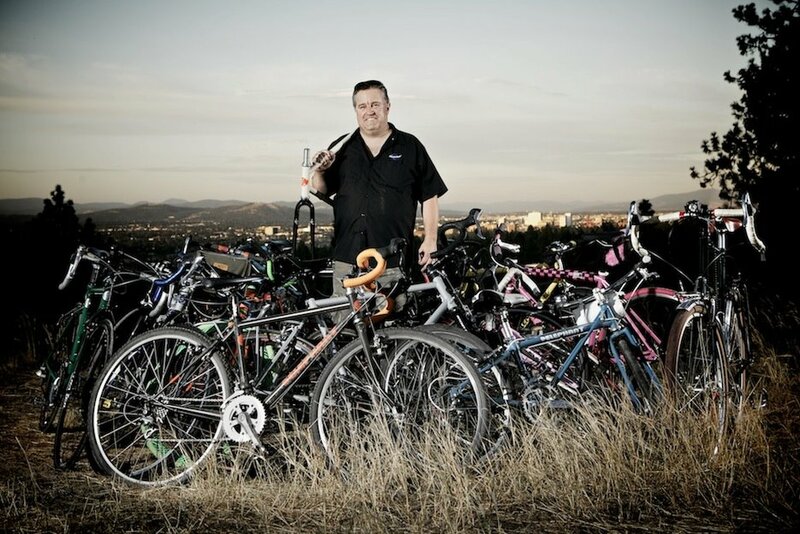 He did production building for Serotta, Bontrager, and Rocky Mountain Bikes. He was in it and has the stories to tell. But one doesn’t get the impression that Copus ever wanted to be a bike industry “name” so much as he wanted to just go to the workshop, put his head down, and build amazing bicycles. When he launched his own bike company Elephant after an 18 year stint in metal fabrication, he chose the name in part to keep his own off the downtube. Today, Copus continues to build Elephant bikes out of his garage workshop in Spokane, WA–a mix of custom frame orders and small-batch production runs. In this interview, Copus discusses his long history in the bike world from shop rat to professional builder, life as a race mechanic, bike art versus commonsense craft, the business side of frame building, and more.